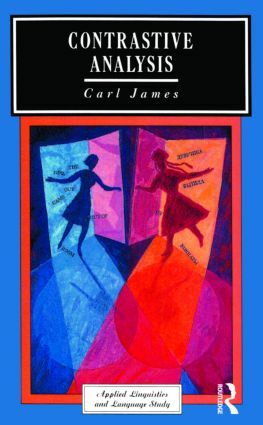 In this important study, Carl James reviews the role that contrastive analysis can play in understanding and solving problems in second or foreign language learning and teaching. Using both psycholinguistic and linguistic analysis, he establishes a sound theoretical basis for CA before going on to illustrate its contribution to the study of linguistic universals, bilingualism, and language pedagogy. The book offers a range of examples to support its arguments, enabling readers to grasp the principles and then to pursue their own work in this area. Contrastive Analysis presents a successful theoretical and practical case for the value of CA as a research tool, both for those studying applied linguistics and for teachers needing to adjust their teaching to the state of knowledge of their students.